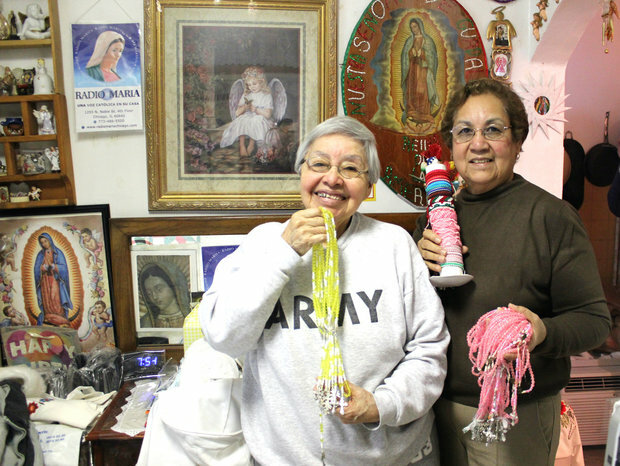 Amalia Alejo, who immigrated to the U.S. from Mexico, has called Pilsen home since 1975. Now 70, she said she hopes to one day pass her 19th Street home down to her daughter. 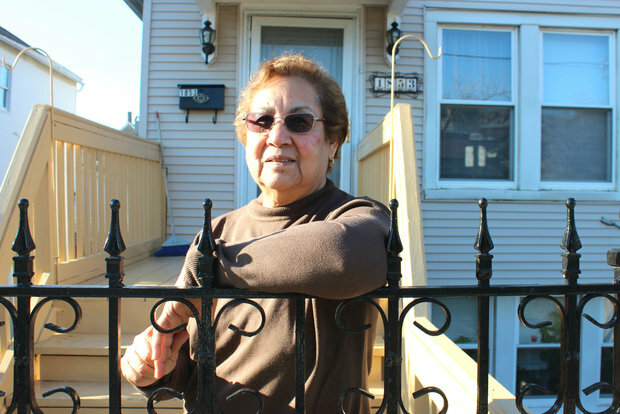 PILSEN — On 19th Street — in the home where her mother died and her daughter was raised — Amalia Alejo scans the block. "Instead of more Mexicans on my block, right now, we have more Anglos," Alejo said in Spanish. A new study confirms what Alejo and other longtime residents are feeling — that Pilsen is losing Hispanics — and particularly Hispanic families — by the thousands. Meanwhile, more whites are moving in, and they tend to be single and wealthier, the study found. • Pilsen is still majority Hispanic, but more than 10,300 have left the neighborhood since 2000, a 26 percent drop. As of 2013, an estimated 28,835 Hispanic residents were living in Pilsen. • The number of whites grew by 22 percent, from 3,587 in 2000 to an estimated 4,385 in 2013. • While Pilsen's population overall plummeted by nearly 15 percent from 2000-2010, the biggest drop — 41 percent — was in the number of families with children living in the neighborhood. • The neighborhood is no longer as major of a gateway for new immigrants as in the past, as second- and third-generation Hispanic households now outnumber first-generation households. In short, Pilsen is whiter by the day, Betancur said. "If anything is evident in Pilsen [it] is the steady decline of Latinos and the sharp growth of whites throughout all census tracts," he said. While the neighborhood is still a majority Hispanic, the ethnicity has left the neighborhood by the thousands, the report shows. In 2000, Pilsen was 89 percent Hispanic. In 2013, the neighborhood was 81.6 percent Hispanic. During that time, white residents increased from 8.2 percent to an estimated 12.4 percent of the total population, according U.S. Census data. Meanwhile, the role of Pilsen as a port of entry for Mexican immigrants is changing. As of 2013, Pilsen was home to an estimated 14,290 foreign-born immigrants, a 34 percent decrease from 2000. During the same time period, Chicago had a 9.5 percent decrease in immigrants living in city limits. Whites living in Pilsen also make more money than their Latino counterparts. As of 2013, the average white household living in Pilsen made $41,760, compared with the average Latino household, which made $32,126 annually. The change in demographics has real consequences for Mexicans and Mexican-Americans who have called Pilsen home for generations, Betancur said. After a pit stop near Los Angeles, Mexico native Alejo moved to Pilsen, renting a coach house apartment on 19th Street in 1975. Over the next few years, her brother died, and then her mother. Soon after, she became a first-time mom to her daughter Faviola, and with her sister-in-law and her children, Alejo eventually moved into the property's main house that faces what is now the Museum of Mexican Art. After living in Compton, Calif., Pilsen seemed like a dream. "It was so beautiful. A lot of the stores spoke Spanish. I knew all of my community," she said. In 1982, with help from a neighbor, a loan and some luck, Alejo was able to buy the house she was living in for $24,000. Over the years, the 70-year-old has helped other families save for homeownership by renting them a unit in her building below market rates. Her two current tenants pay $600 or less in rent each, she said. Owning her own home made her feel accomplished, she said, and Alejo wold like to one day pass the 140-year-old house down to her adult daughter. But as new residents move in and property taxes continue to rise, Alejo said she doesn't know if she can afford to keep the house. "I'd love to keep it in the family. But the day that I can't afford it, I'm out," Alejo said in Spanish. "But I've got so much here — my mom died here, and so many happy moments." Reporter Stephanie Lulay talks about the changing face of Pilsen. In general, newcomers and historic Pilsen residents live parallel lives, not interacting with each other, Betancur said. "They don't bother me, but we're separate," she said of her new white neighbors, many of whom are students. Data shows that fewer families with children now live in Pilsen. The number of households with children ages 18 and under decreased 41 percent from 2000-2010. In 2010, an average of 2.92 people lived in each Pilsen household, compared to 3.43 in 2000. While more whites are moving into Pilsen, the racial makeup of Chicago Public Schools in Pilsen largely remains the same. About 95 percent of Benito Juarez Community Academy High School students are Latino, according to CPS data. "We could be the face of gentrification"
For some young urban couples, Pilsen's affordable single-family homes are a big draw. Pete Probst, an environmental consultant and former UIC student who identifies as white, moved to Pilsen with his wife Megha Patel eight years ago, first renting and eventually buying a 140-year-old, four-unit building near Harrison Park. During those eight years, neighbors have told the couple that they are happy Pilsen is becoming more diverse, Patel said. "We're really friendly with our neighbors," Patel said. In the fall, the couple attended a Pilsen Alliance meeting on housing to discuss the issues at hand. Two-bedroom units in his building rent for $700 a month, he said. "We could be the face of gentrification without really knowing it," Probst said at the time. "I've been steadily fixing up the building, because the only thing I could afford to buy was a fixer upper. Naturally, as we fix it up, it's going to be worth more for rent, and rents are going to go up. I don't see that as being a bad thing, from my perspective. But if we had to kick somebody out because they could no longer afford the rent, I can see how that would be an issue for them." As more Mexican families move out of Pilsen, the population shift and loss of community can create problems for the existing low-income immigrants who depend on the neighborhood for their many needs, Betancur said. "The loss of Pilsen for Latinos is complex," he said. "They need to rely on neighbors, non-profits, churches, schools with bilingual education. For these groups, living together is very important. When you talk about Latinos losing people in Pilsen, you are losing your home, and where you can go from there is more limited." Soon, Alejo and others will lose their longtime Catholic parish. Citing the declining Latino population in the neighborhood, the Archdiocese of Chicago announced earlier this year that three churches in the neighborhood, including St. Adalbert, would close. "It makes me so sad. My daughter was married there," Alejo said. While gentrification has intensified in the last 15 years, data shows Pilsen is still a low-income, working-class community — for now, Betancur said. Pilsen has undergone a slower gentrification than some other Chicago neighborhoods, like Wicker Park or West Town, that have seemingly gentrified in a decade, said Betancur, who has studied Pilsen since he launched UIC's Instituto Del Progreso Latino in 1975. Despite its proximity to Downtown, Pilsen's housing stock — with sunken backyards and sunken first floors on some streets — and environmental issues have kept some buyers and investors at bay, Betancur concluded. And the ongoing efforts to fight gentrification and the Mexican community's overwhelming desire to stay have slowed the process by decades, he said. "In my opinion, the big reason Pilsen is still Mexican is because the community is so resilient. Families will do whatever they can to stay, even if they have to pay more in rent. They will triple up in a house, rent rooms to other people. They have done a lot of things to stay," the UIC professor said. Some Mexican families choose to leave Pilsen on their own, said Ald. Danny Solis (25th). Some residents moved to the suburbs to be closer to work and other longtime homeowners are happy to cash in on their investment as property values rise, he said. Before it became a Mexican enclave, Pilsen was first occupied by Czech immigrants in the late 19th Century and subsequently by other European working-class immigrants. In the 1960s, as Latinos were displaced from the neighborhood UIC currently occupies, Mexicans moved into Pilsen. By 1970, Pilsen was the city's first majority Latino community, according to U.S. Census Bureau statistics. Today, Pilsen is "better than ever," said Solis, who grew up in the neighborhood. "As the neighborhood improves, it's only natural that all types of people will want to live here," Solis said. 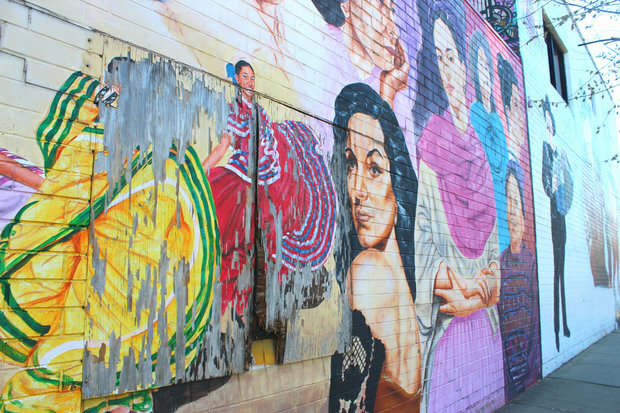 Despite recent changes, Pilsen's Mexican roots — evident in the neighborhood's murals and taquerias — remain the neighborhood's biggest selling point, Solis said. 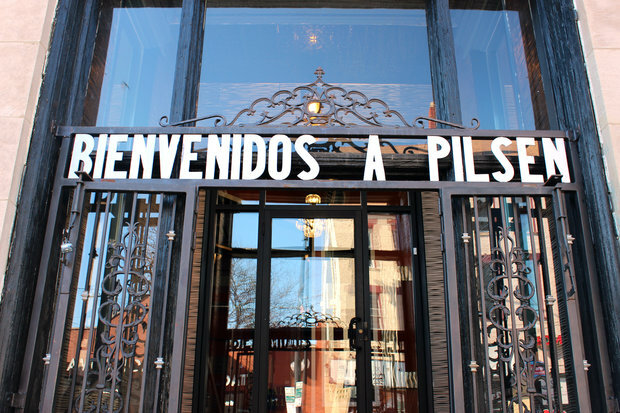 Whites move to Pilsen because "they want to experience 'the Barrio.' It's relatively cheap rent, and it's very close to the university, very close to downtown," Solis said. And while more whites are moving in, Solis said he's taken many steps to maintain affordability in the neighborhood for existing residents. During his 20 years as alderman, more than 400 units of affordable housing have been built in the area; the Pilsen Historic District was created, allowing property owners within the district to apply to freeze their property taxes for 12 years; and he developed a mandate requiring a minimum of 21 percent of most new developments to be designated as affordable housing units. But not all politicians agree that the changes happening in Pilsen are good. At a Pilsen Alliance housing fair earlier this month, Cook County Commissioner Jesus "Chuy" Garcia said the neighborhood is "under attack." "I hear a lot of rhetoric about how Pilsen is getting 'better,'" said the former mayoral candidate, who also grew up in the neighborhood. "But those improvements are invariably built on push-outs and transformations that are highly destructive to the people of this neighborhood." Pilsen is a welcoming community, said Pilsen Alliance Executive Director Byron Sigcho, who has rallied against gentrification in the neighborhood. "But we are not stupid. We will not be displaced without a fight," Sigcho said. "Gentrification is a segueway for another Wicker Park, another Lincoln Park. And Pilsen is Pilsen! It's a unique place and we want to protect its identity." Solis said he wants to maintain as much of Pilsen's ethnic influence as possible, he said. The faces in the neighborhood may change, but the neighborhood's cultural identity — the murals, restaurants, schools and museums — will remain Mexican, he said. "My dream is that it becomes a bit like Chinatown," he said. As whites move into Pilsen, Solis said he hopes the neighborhood also welcomes back "young professional Latinos" who have family ties to the neighborhood. "I know that there are people who have moved out, but I also know there are people that have moved in. I can't get a shotgun out and say, 'What are you, Mexican American or white?' People like it, and that's why they are moving in," he said.